Carrots are one of the most popular vegetables in Britain and appear in British and Irish food in many, many guises. They underpin, soups, stews, casseroles and sauces. Their sweetness and colour make them a great ingredient when added raw to salads. As a cooked side dish, they are considered less enticing and often pushed aside for sexier, more trendy vegetables. Well not any more. Take the simple carrot, give it a wash, top and tail just a little and roll in olive oil, a light sprinkle of sea salt flakes and pop into a hot oven. The transformation is astounding, the carrots keep their texture but come out of the oven sweeter than when they went in, thanks to the caramelisation of the natural sugars. So easy, you will probably never boil them again. Take the washed carrots and trim the tops a little; do not remove the top simply trim down to a centimetre or two (1/2 to 1 inch). If the carrots are fatter than a middle finger, cut them in two (or possibly three depending on the size). Be careful to not make them two thin or they will shrivel in the oven. Peel the red onions, keep the top and bottom intact and cut into 6 segments. 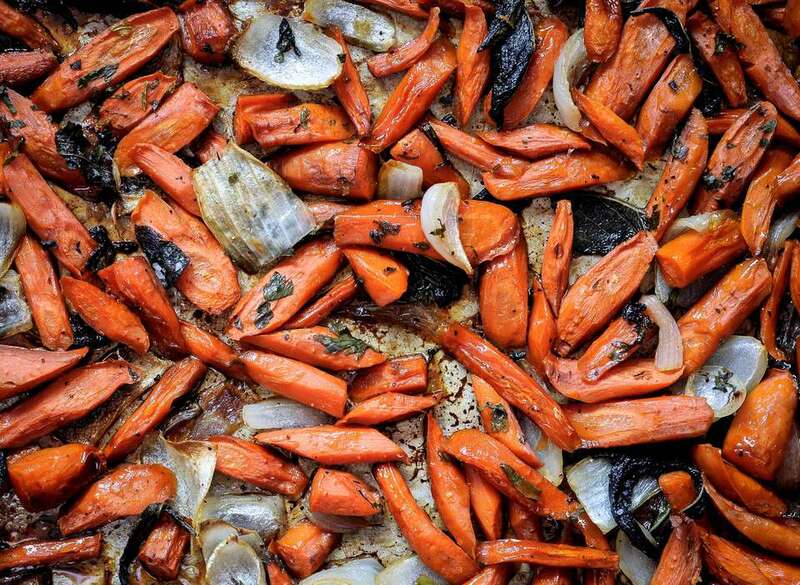 Lay the carrots and the onion segments on to a heavy baking sheet. Sprinkle over the olive oil *** the using your hands roll the carrots and onions around to make sure they are coated in a the oil. Sprinkle on the sea salt flakes. Pop the tray into the centre of the preheated oven and roast for 35 minutes or until the carrots are caramelised but not burnt. The length of time depends on the thickness of the carrots, so keep an eye on them. Once cooked serve immediately. The roasted carrots are lovely as part of a Sunday roast, as a side dish with a stew or casserole, they are even delicious cold, or reheated in a Bubble and Squeak. Add a few parsnips to the onion and carrot mix and roast exactly as above. Add a handful of halved Brussels sprouts 15 minutes before the end of cooking. Do not add them too early or they will burn. Dust the carrots with a light sprinkling of cumin seeds to give the carrots a deeper and lightly spiced flavour. Not recommended for a Sunday lunch, better for a midweek supper. *** If you prefer a flavourless oil use a rice bran or vegetable oil instead of the extra virgin olive oil.